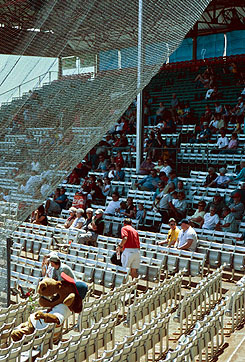 The Grandstands of Ray Winder Field, which opened for business in 1932. If the crowd looks a little thin, note that everybody's sitting in the shade. The first recorded baseball game in Little Rock took place on May 6th, 1867. An upstart team modestly calling itself "Galaxy" challenged the established champs "Pulaski." Pitching for the Galaxy was Albert Pike. If you know the name, you're either a freemason or a modern conspiracy theorist who believes that Albert Pike was a member of the inner circle of a secret cabal of illuminati whose object was to dominate the earth. Well, maybe the conspiracy has advanced some since 1867, but on that day Pike didn't even manage to dominate the little mound of earth from which he pitched. He gave up 67 runs. The Galaxy lost to Pulaski 67 to 15. On this Sunday afternoon in May, the Arkansas Travelers faced the Tulsa Drillers at Ray Winder field. 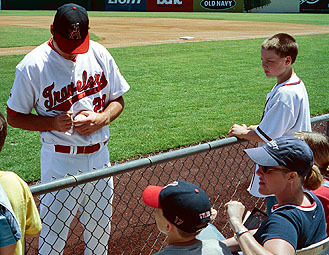 The Travs are a minor league team connected to the Anaheim Angels since 2001. For years they were hooked up with the St. Louis Cardinals, but recent disagreements precipitated a split. One bone of contention was that St. Louis wanted the Travs to scrap their rickety old facility and build a brand new field downtown like their Memphis club just did. Collecting autographs by the Traveler dugout before the game. When I was that kid's age I did the very same thing on this very same spot. When the World War II veterans were that kid's age, they did the very same thing on the very same spot. That's the essence of tradition, an experience shared across time that defines a culture. Rickety old stadium indeed! Danoyvadatguy! Whyoueyeotta.....! Tearing down the old ballparks won't help baseball any more than tearing down the old cathedrals would help Christianity. 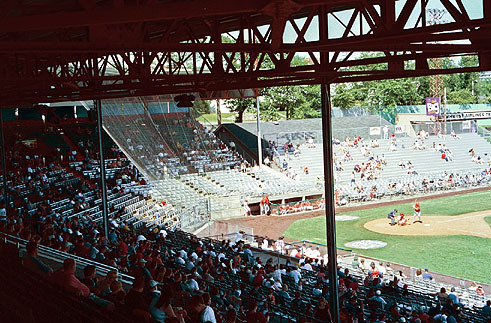 This ballpark opened in 1932 as Travelers Field, the home field of the Little Rock Travelers. In 1892 a team called the Little Rocks were playing at Clinton (no relation) Park located at the present site of Adams Field, a.k.a. Little Rock National Airport, and they might have been the forerunners of the Little Rock Travelers, who joined the Southern Association league in 1895, according to the Lester Book. The Arkansas Travelers official website says the Little Rock Travelers joined the Southern Association in 1901 and played at Kavanaugh Field, the present location of Central High School. The Little Rock Travelers were the real deal. In the 1937 exhibition season they beat the New York Yankees and the Cleveland Indians on the same weekend. Yes, that's THE World Series Champion 1937 Yankees, and in answer to your next question, Bobby Feller DID pitch for Cleveland that game. A minor league team doesn't play at that level forever, sad to say, and attendance rises and falls with the fortunes of the team, vicissitudes of fashion and competing entertainment. In 1957, in hopes of expanding their appeal and drawing fans from farther away, the Little Rock Travelers became the Arkansas Travelers. That didn't quite do the trick. The franchise was sold to Shreveport in 1958. Shelly, the Traveler mascot, taking a load off, planning the next episode of mascot hijinks. Enter Ray Winder, who didn't really enter. He had been there all along, starting as a ticket seller in 1915, and had been part owner since 1944. He organized a public stock drive, selling shares at five bucks per in order to buy a bankrupt New Orleans franchise and resurrect the Travelers in Little Rock. There are guys all over town in their fifties who have those stock certificates, the ones they bought with their allowance money and lawn mowing money, framed and hanging in their offices. There were a lot of clubs failing in those days, and Winder scouted players from all over the country who were just past their prime, plenty competent, but without much in the way of career prospects, some older guys with a little name recognition who could draw customers. If you want to get cynical about it, you could say Ray Winder cashed in his ownership in the sale to Shreveport and started the New Travelers with somebody else's money. The answer to that is, our money, our Travs. Tell it to Green Bay. Whatever the motives, the strategy worked for everybody. The team won the Southern Association playoffs and finished third overall. Winder (rhyming with blender) was the guy that saved baseball in Little Rock, and he did it when he was 75 years old. Five years later he retired. The next year the park was named for him. He passed away shortly thereafter at the age of 82. So what does it cost and what do you get? Well, it's five bucks to get in. The parking is free. The beer is $2.75 a can. You can get two beers for what you'd spend on parking if the park were downtown. Paying a lot for ballpark refreshments is part of the experience anyway. What do you pay for popcorn at a movie theatre? 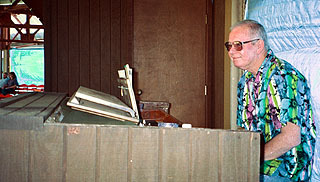 You get live organ music, a tradition disappearing in American ball parks. Travs organist Rich Pharris is such a fixture he's got a fancy nameplate on his organ, and how many of us can make that claim? You get games and entertainment between innings, mostly for the kids, a race between some ten-year-old and Shelly the mascot. The kid wins a cap when Shelly gets winded and collapses halfway down the third base line. Catching a can of corn in a trash can. Winner gets to keep the corn. A lot of standard goofs aimed mainly at young families. And by the way, lest I forget to mention, there's a live baseball game going on right in front of your eyes. And young families represented the main body of spectators on this Sunday afternoon. Mom and Dad could park themselves in the grandstand and watch the kids wherever they might roam. There are those picnic style games going on, and the kids can go sign up for them. You got the big cartoon horse mascot to play with, like a giant walking plush toy. For the older kids who brought their gloves, those kids crowded into that magic section just past the net can get the autographs of the players; and there is always, dare we even wish it, the possibility of catching a foul ball. Here comes the part where I write something that makes people mad at me. You'll read on the official history and hear from various sources that Ray Winder Field is either the fifth oldest or one of the five oldest active professional sports venues in the country. It just ain't. Here's a list of minor league fields older than Ray Winder. If you add to that list Fenway, Wrigley and Yankee Stadium, then add the three horse tracks that host the triple crown (Churchill Downs, Pimlico and Belmont Park) and throw in the Indianapolis Motor Speedway for good measure, very quickly we see there's just no basis for the claim of Ray Winder Field being the fifth oldest active professional sports venue in the U.S. There are at least twenty-one older. I don't know how the claim got started, but I guess I'm the first one ever to question it. It might have happened the way Herman Davis became the "Fourth Greatest Hero of WWI" or the way Field Kindley became the "Fourth Top Fighter Ace of WWI." If you claim to be first or second, you have to prove it. If you say fourth or fifth, nobody checks. Find Ray Winder Field at Fair Park in Little Rock. I heard from Charlie O'Reilly, from whose website I got many of the construction dates of America's minor league fields. A lot has happened in three years, and depending on how the question is phrased, Ray Winder Field has recently moved from twenty-somethingth oldest to anywhere from eighteenth to eighth. Here's his reprinted note. Stockton Ports, Billy Hebert Field: not anymore. They move into Banner Island Ballpark for 2005. New Haven Ravens, Yale Field: The club moved to Manchester, N.H., in 2004. But the field now has the New Haven County Cutters of the Can-Am League. Macon Peaches, Luther Williams Field: The team and league (Southeastern) are defunct. Lakeland Tigers, Henley Field: It's still there, but the Tigers only played there in 2002 before moving back to a renovated Joker Marchant Stadium. Greensboro Bats, World War Memorial Stadium: not anymore. They move into First Horizon Park for 2005. Auburn Doubledays, Falcon Park: The field's been in use since 1927, but the current stadium was built in 1995. Batavia Muckdogs, Dwyer Stadium: The field's been in use since 1930, but the current stadium was built in 1996. Asheville Tourists, McCormick Field: The field's been in use since 1924, but the current stadium was built in 1992. Vermont Expos, Centennial Field: The name of the park is listed incorrectly on your page. So Ray Winder Field appears to be the 8th oldest current stadium in the minors, and the 11th oldest in baseball. Of course, if you count "venues" rather than facilities, you can add the three rebuilt places (Auburn, Batavia, Asheville). Finally, I seem to recall that Belmont Park was rebuilt as well; for a number of years, it was dark and the Belmont Stakes was run at Aqueduct Race Track, a couple miles away. I'm also not sure that Pimlico Race Course has hosted the Preakness Stakes for its entire history. Continued good luck with your pages! As usual, it depends on how we parse the claim. If we say "oldest continuously active" as opposed to "oldest active" then we eliminate parks that had a dark year. But if we do that, we have to remember that Ray Winder had a dark year when the Travs were sold to Shreveport in 1958. Then do we say "pro sports venue" "baseball venue" or "minor league venue." All this is about to be rendered moot, I'm afraid. It was recently announced in the paper that the Travs just acquired land for a new stadium in North Little Rock. The Travs are about to abandon the venerable old park. If you want to experience the sacred atmosphere from baseball's Golden Age, better get out to the park this year. Bailey, Jim; The Arkansas Travelers -- Seventy-Nine Years of Baseball, Arkansas Travellers Baseball Club, 1980. Lester, Jim and Judy; Greater Little Rock, The Donninng Company, Pub. 1986. p. 166. Miller, Leon C., "Little Rock's Golden Calf: The Jazz Age Baseball Battle in Pulaski County," Pulaski County Historical Review, V. XXXVI, no. 1. pp1-17. Sherwood, Diana; "The Arkansas Travelers -- Seventy-Five Years of Baseball," Arkansas Gazette, 6 September 1942, mag sec, p. 1. Arkansas Democrat/Gazette; (Articles on Renovations) 01/31/99 C11; 06/27/99 C6; 09/30/99 C5.